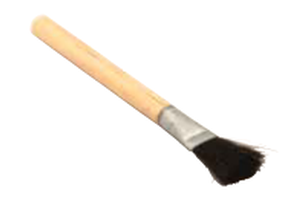 Wood Handle Dope brushes are manufactured by securing horse hair fill to a wood handle with a metal ferrule. We have one standard brush offering with 1 3/16" diameter, 1 1/8" trim length and 7" in overall length. This brush comes in a standard pack of 36 units. This brush is commonly used for applying pipe dope but can also be used to apply glue, paste, solder and as a general-purpose cleaning tool.